Nic Salts: Fad or Future? Vaping has emerged from a trend to a full blown subculture in the last decade. Cloud Chasers, DIY crafters, and squonk boxes are just a few examples of a diverse and intricate vape community. New products like sub-ohm mods and eclectic e-juice flavors breed innovation and encourage marketing efforts to keep the industry fresh. Marketing also drives trends. Right now, the biggest name on the market – by a wide margin – is the Juul (read our review here). Its popularity is in part due to the sleek and compact nature of the device. Another reason for its popularity, however, is their patented formula of nicotine salt (nic salt) juice. The rise in nic salt popularity thanks to the Juul has bred competition in the vape market over a new hype product. Nic salts are highly concentrated, but still smooth to hit. They deliver a unique vaping experience unlike traditional vape juices on the market. It’s not an experience every vaper will enjoy, though. Nic salts were developed originally for specific users and specific devices. So, what’s the hype for? Why are nic salts gaining in popularity, and who should be using them? We’ve covered some of the basics before, but let’s take a closer look at one of the vape industry’s growing trends, and the science behind why it’s catching on. Nicotine occurs naturally in the tobacco leaf as a salt (not like a crystal though, no). Salts are the result of a chemical reaction between an acid and a base. But, since nicotine is a weak base and wants to stabilize, its particles naturally seek out positive particles (protons) to become ionized. Ions do not easily move through our membranes. Hence, tobacco companies developed “freebase” nicotine. The tobacco in cigarettes today is a manipulated version of the natural leaf, developed in the 1960s. Scientists at big tobacco companies manipulate nicotine by removing the positive charge (de-protonating), creating what is known as “freebase” nicotine. Despite the connotation, the word freebase simply refers to a base chemical without any protons. Without protons, nicotine can more readily travel through our bodies, lungs, and brains. A higher level of bioavailability makes nicotine more potent and addictive. Nicotine salts more closely resemble the sensation of smoking a combustible cigarette than freebase nicotine does. A couple of puffs on a pod vape with salt-based e-liquid is all a user needs to get the right “nic fix.” Freebase nicotine is made to vape deeper and longer draws. A lower concentration with the power from an open system mod provides a smooth hit and a good nicotine level. That’s why the most accessible freebase e-liquids on the market are around 3-12mg nicotine. At the high nicotine concentrations in nicotine salt juices, freebase e-liquid would deliver an extremely harsh throat hit. Quick uptake of high levels of nicotine in an open system could also cause illness or nicotine poisoning. Vaping salt-based or high-level freebase nicotine using powerful vapes – like sub-ohm devices – is not advised. If the goal is to produce bigger clouds and puff more, typical freebase e-liquids are the way to go. Higher end concentrations of freebase e-liquid typically available on the market reach about 24mg. If nic salt doesn’t travel through membranes as easily, though, how could nic salt be as effective as cigarettes? One manufacturer has developed, and patented a solution, boasting 59mg nicotine and a smooth throat hit. The company most responsible for bringing them back into the limelight is Pax Labs. 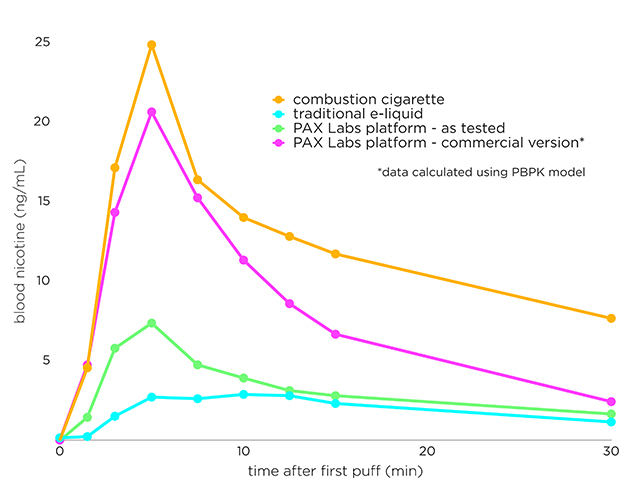 Pax Labs, parent company and manufacturer of Juul vapes, patented a nic salt-based formula for their juulpods in 2015. Juulpods are the branded e-liquid cartridges used with the Juul vape device. The Pax Labs proprietary juulpod liquid ionizes nicotine using benzoic acid to simulate the feel and throat hit of a cigarette puff. Benzoic acid lowers the pH of the vapor, giving it a smooth hit. At the same time, the acid raises the bioavailability of the nicotine, giving it a potency similar to the effect of a cigarette. Juul Starter Kits retail for $49.99, including the device, charger, and a 4-pack of various flavored pods. Pod vapes are usually stocked in local vape shops. Typical retail stops like gas stations, are starting to carry pod vapes and refill cartridges almost as readily as cigarettes. Be sure to verify your pod vape purchase with the QR code or serial identifiers found on the device and/or its packaging. Counterfeit vapes of lower quality and with impure ingredients are difficult to spot without doing some due diligence. Pod vapes like the Juul are not the only way to get into the nic salt hype, though. Folks looking to use their old vape pens and low-power devices can find nic salt e-liquid for purchase. Or, use lower level nic salt e-juice (18mg) in a 220w mod and get the combined joy of decent-sized clouds with a mellow throat hit. For open systems, there are a growing number of full lines of nic salt e-juices available. We recently reviewed some of our favorites. Nic salts offer a relatively new vaping experience for many users. Experiment with what works, but be smart about it. Overall, research on the effects of vaping is still in its relative infancy. We may have information on the constituent components of vaping, its ingredients and chemical features. Vaping as a form of nicotine uptake and its potential longitudinal effects on the human body, though, is perhaps still too early to be definitive. Salt and freebase nicotine are relatively safe for consumers, with no major health comparisons. Still, consumers should be aware of the few potential concerns they may face. Benzoic acid requires further study. There is no body of work on inhalation exposure. Some research does exist to suggest benzoic acid can trigger coughing or pseudoallergic reactions. Also, given the higher concentration of nicotine, nic salts are possibly more addictive than freebase juices. A higher nicotine level means higher nicotine blood content quicker, triggering a faster dopamine release. The health effects of nicotine salts, just like everything else in the vaping world, still needs to be studied further. Nic salt juice may seem to be trending in the vape scene right now. While it does have its reasons for getting popular, it won’t be for everyone. Try a friend’s pod vape or nic salt juice to see if it’s a good fit before committing to the investment. I originally went from cigarettes to 6mg juice to 3mg juice. With a ~50mg nicotine level, nic salt juice may be overwhelming for a user like me, or even make me sick. Nic salts are designed with a specific user in mind. Folks using smaller, pod vapes looking for a full strength hit will benefit from using nic salt juice. For beginner users, especially those looking for a simple transition from and similar experience to combustible cigarettes, pod vapes with nic salt-based formulas may be the best option. DIY juice crafters may save money with higher levels of nicotine (though not above 18mg with a sub-ohm mod). Given Juul’s enormous market share, their nic salt vape pods are well-stocked in vape shops, tobacco retailers, and online stores. DIY vapers are crafting nic salt e-juices to keep for times when they want fewer pulls, or a harder nicotine hit. The community is divided on closed systems and “beginner gear” overall, however. Not everyone is so keen to jump on the salt bandwagon. The explosion of pod vapes on the scene has some die hard mod users offended. For some, vaping is a craft. Those who build their own mods, coils, mix juices, may not have the same interest in what is “big in the industry” right now. Everyday smokers, or vape users who want to have a quick “nic fix” on hand, however, stand to benefit from the advent of nic salt juices. So far the benefits outweigh the problems for nic salts, but we should be careful not to fetishize any product before we know enough about it. The post Nic Salts: Fad or Future? appeared first on VaporVanity.